Last week we learned some subjective nouns and their declension in Tulu. I hope you had no problems with them. 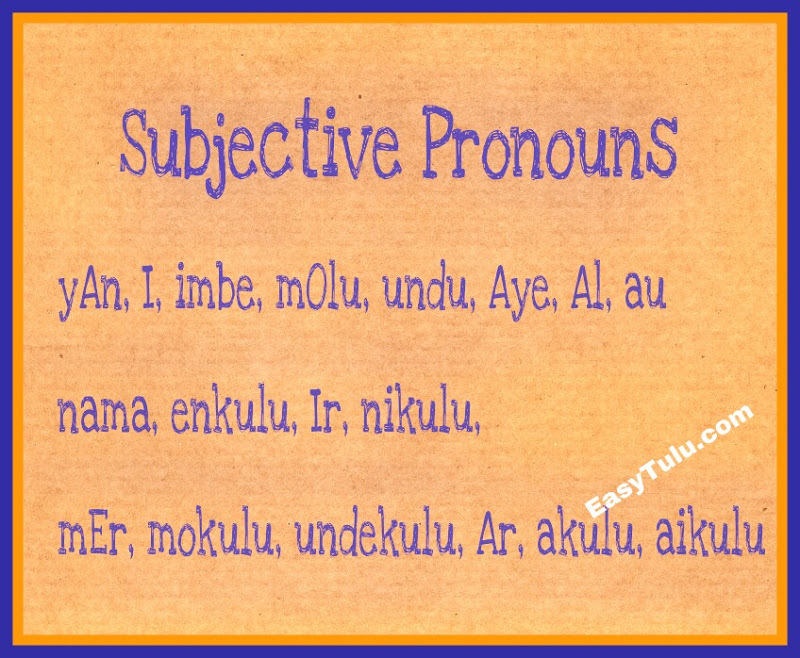 Today we are going to learn subjective pronouns in Tulu. Hopefully you know them in English. 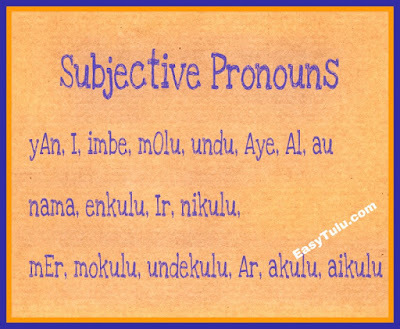 These are the subjective pronouns: I, you, he, she, it, we, you, they. Now, let’s see their equivalents in Tulu. Now we have learnt some subjective nouns and pronouns in Tulu. Let me explain each case briefly for you. Nominative generally marks the subject of a sentence. Apart from this, it also marks things equal to the subject. The suffix ‘e’ is added only to masculine singular nouns ending with ‘a’ vowel. Eg: ‘rAma’ becomes ‘rAme’ in nominative case. If nouns ending with other vowel or consonant sounds, then there is no suffix added. Most of the modern masculine names end with consonant sound, but they actually had final ‘a’. Eg. Karthik, Harish etc. In this case, it is optional to add suffix. Eg. harIshe/harIsh onas malthe – Harish had lunch/dinner. The suffix ‘o’ is added only to neuter singular nouns ending with ‘a’ vowel. Eg. ‘mara’ becomes ‘maro’ in nominative case. But it depends on dialect. 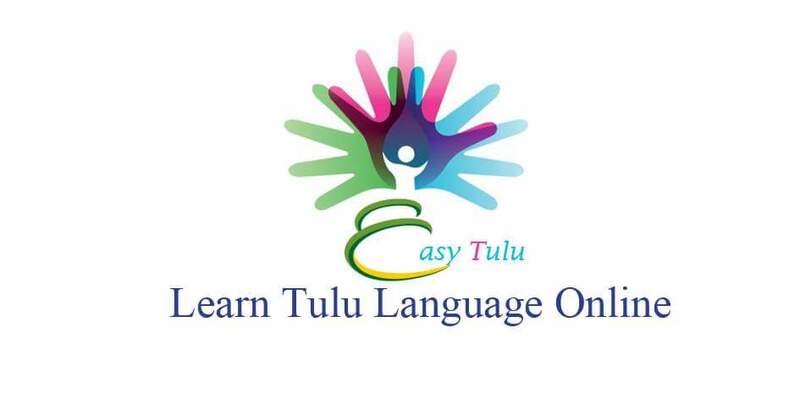 In common Tulu, there is no suffix added to neuter nouns. So both ‘mara’ and ‘maro’ should be correct. Also, there is no suffix added to feminine nouns. rAdha battal – Radha came. Accusative used to mark the direct object of a verb. If the preceding vowel is ‘u’ or ‘o’, then ‘nu’ is added instead of ‘n’ to make it easier to pronounce. Eg. guru – gurunu, maro – maronu. Sometimes noun in its basic form (without any suffix) is used instead of accusative case. Ablative case used generally to express motion away from something. Instrumental case used to express the cause or instrument of an action. Dative case generally used to indicate the noun to which something is given or the motion to a place. To denote intention or purpose. To denote measure and price. Genitive case marks a noun as being the possessor of another noun. The suffix ‘ta/da’ used for singular neuter nouns. Eg: marata – tree’s, eruta – bull’s, pettada – cow’s, Uruda – village’s. The suffix ‘na’ is used for masculine and feminine nouns. Eg: rAmena – Rama’s, ninna - your, Aayena - his, alena – her, akkana – elder sisters, aNNena – elder brothers aklena – their etc. It also used for plural neuter nouns. Eg: aiklena – their, eruklena – of bulls etc. Sometimes suffixes ‘ta/da’ and ‘na’ are omitted. After removing suffixes ‘ta/da’ and ‘na’, if the word ends with a consonant sound then the vowel ‘a’ is added. ill’da piravu – illa piravu – back side of house. Locative case indicates a location. Also it used to express superlative degree of adjectives. This case is never used with singular masculine and feminine nouns. Eg: rAmeD, sItaD or aleD, AyeD are not used. But it is used with singular neuter nouns and all plural nouns. Eg: aiT – in that, aikleD – in/among them (Neut. ), akleD - in/among them (Masc. or Fem.) ANuleD – in/among boys etc. Communicative case generally used with verbs related to communication. To show possession of property. Vocative case used to address a person (animal, object, etc.) being spoken to. dEverae! yAn dAda malpoDu? – O God! What should I do? (Kannada: dEverE! nAnu Enu mADali? All right. With this we come to the end of lesson 2. From next week we will begin with verbs.